A three sided box was constructed containing two sections of equal size and proportions. Each section was 11" wide x 14" length, and 3 sides with 8" height and an open front. 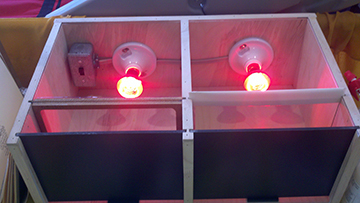 A socket was mounted on the center back wall of each section and a 50w infrared (Heat Glow) bulb was installed in each. A slot was made at 10½" from the back wall in which the test panel could be slid in place. This configuration placed the test panel 5 ¾" from the infrared bulb. Slots were made at the front edge of the box measuring ¼" thick black PVC panels, used to slide in place for temperature measurements. This configuration puts the PVC panels 9" from the bulb and separated by the test panel by 3 ½". A test panel of one product was positioned into the left box and a different test material was positioned into the right slot. Once positioned, the bulbs were switched on. At given times the temperatures of both the left and right black PVC panels was taken with an infrared thermometer and the highest surface temperature was noted for respective sides and test materials. Any data given was accomplished using an average of at least three testings. Any comparisons noted between two materials are based on those respective materials being tested concurrently. Click here to view UV Factors to Consider.